Diclofenac Sodium inhibits the enzyme Cyclo oxigenase and enhances the uptake of Arachidonic Acid into phospolipid pool. This stops the production of Prostaglandin, Leucotrine, Prostacycline, and limits the availability of Arachidonic Acid thereby Diclofenac Sodium is peripherally acting analgesic which is very potent in action. The essential oil of Eucalyptus combines with Methyl Salicylate and Menthol to produce a sensation of warmth due to their rubefacient and counter-irritant properties. 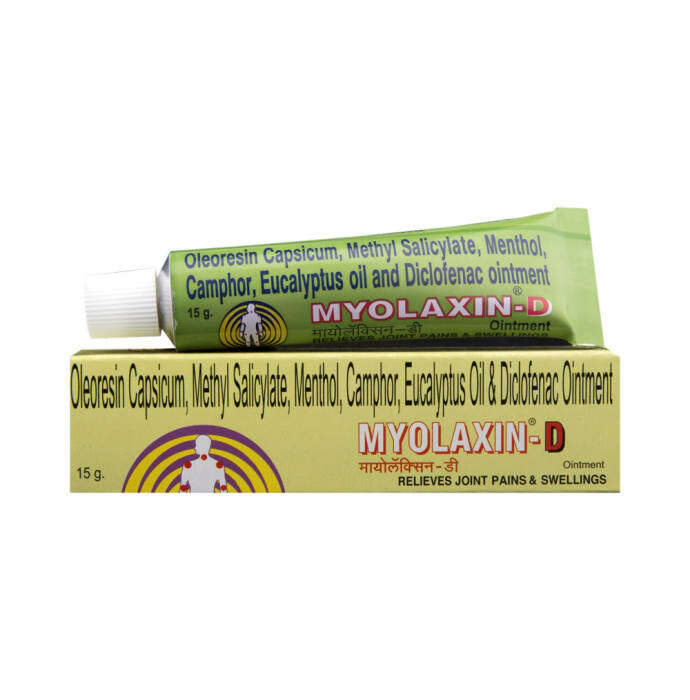 Myolaxin-D ointment can be used in pain in Knee Joint, Neck pain, Musculo Skeletal pain, Arthritic pain, low back pain. Apply Myolaxin-D by hand and gently massage the Gel into the area of pain or stiffness and on the surrounding area until the Gel has been absorbed. Treatment should be repeated two to three times a day. 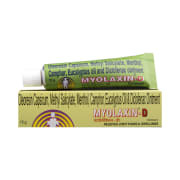 A licensed pharmacy from your nearest location will deliver Myolaxin-D Ointment. Once the pharmacy accepts your order, the details of the pharmacy will be shared with you. Acceptance of your order is based on the validity of your prescription and the availability of this medicine.